So it is the time for a great sadya. As vishu is around the corner, people of kerala will be browsing for some variety traditional recipes to make the vishu sadya extra special and outstanding. Thoran /upperi / vegetable stir fry recipe has a remarkable role in kerala sadya or kerala cuisine. Here am with a special upperi or thoran with horse gram / muthira, which has got several health benefits. Horse gram is widely consumed in South India. This beans are very easy to digest and contains plenty of calcium, phosphorous, iron and protein. Because of these reasons, horse gram is considered as beneficial to human health. The nutritional content of this beans contribute to weight loss as they are rich in fiber and protein. Regular consumption of this beans also helps in reducing blood glucose level. Like so horse gram consumption is very healthy and so why can't we go for a stir fry recipe with this magical beans? 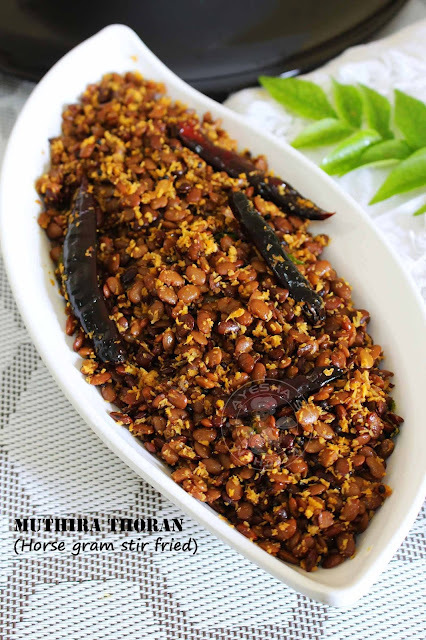 Moreover this upperi / thoran recipe is very tasty too. Here is the recipe for muthira thoran/ kerala dishes / sadhya recipes/ veggie stir fry recipe / vegetable stir fry / onam sadya recipes /onam sadya items with horse gram. Sadhya is a combination of variety of dishes which is served in banana leaf. A complete vegetarian meal which is prepared especially during special occasions like onam, vishu, wedding etc. The main ingredient for sadya is rice (matta rice) which is served with several other side dishes like sambar, upperi, aviyal, pachadi, kalan, olan, kootukari, pickle, pulinji, pappadam, payasam, rasam, moru, sharkara upperi, kaya varuthath etc. Each dishes must be served specific order and specific place. Any way there are variations in sadya menu according to place and region. Soak muthira / horse gram in water for 2 hours or more. Drain it and pressure cook it for 3 whistles with required water and salt. When done, remove the lid and transfer the cooked horse gram(muthira) to a separate bowl. And also set aside the horse gram cooked water in another bowl. Now coarse grind all the ingredients given under 'to coarse grind'. Set aside. Heat a pan or wok. Add oil and once hot, splutter mustard seeds. Then fry dried red chilies and curry leaves. After a while, add the coarse ground coconut mixture and saute well for two minutes over a medium low flame. 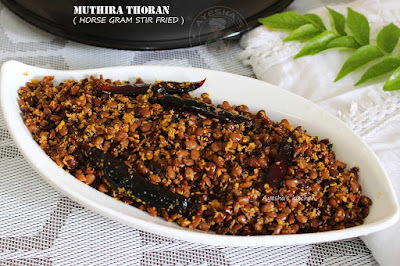 Then add the cooked horse gram (muthira) and combine very well. Add salt and close the lid. Cook for a minute and then add a few tablespoons of stock water ( horse gram cooked water). Mix well to combine. Again cook it over a low flame for couple of minutes. Horse gram / muthira thoran / muthira upperi is ready to serve. Serve this muthira thoran along with steamed rice as a side dish.